Rob Caragher gets a shower after the Spartans held off Wyoming during Saturday’s homecoming game (Associated Press). 8 for 23 — The number of times this season the Spartans have converted red zone visits into touchdowns. 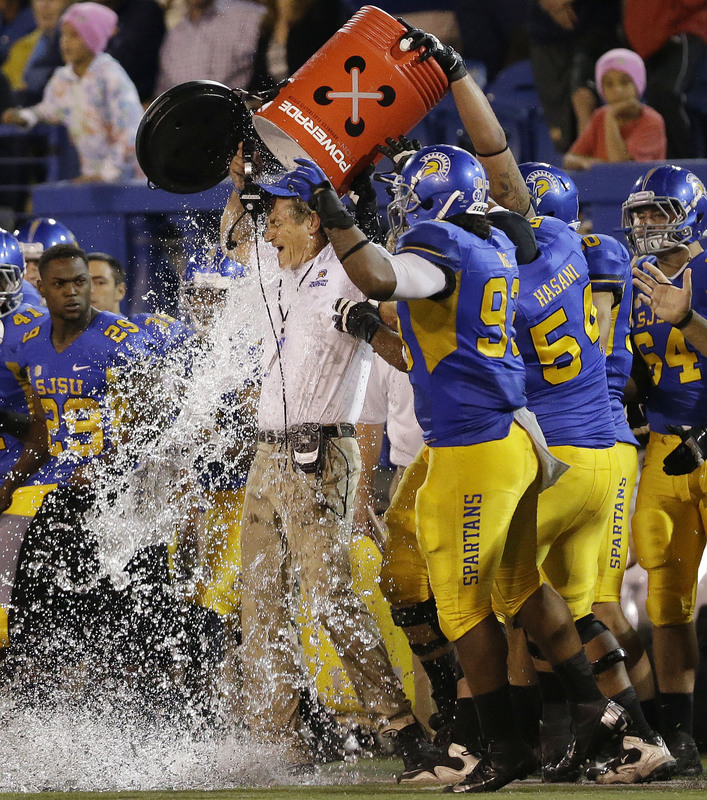 San Jose State entered this game 4 for 18 for TDs in the red zone this season. The Spartans were 4 for 5 turning red zone visits into touchdowns against the Cowboys, first near the end of the first half on an eight-yard pass from David Fales to Chandler Jones, then in the third quarter on a 9-yard run by Tim Crawley after a Wyoming fumble deep in their territory. Later in the third, David Fales almost threw an interception in the end zone on a third visit, and Austin Lopez missed a short field goal. Then, after forcing another three-and-out for the Cowboys defense, the Spartans back to the red zone, where Fales hit tight end Shane Smith on first and goal for a third TD. It’s the first time this season San Jose State has turned multiple red-zone visits into touchdowns this season. The coup de grace was Fales pushing in a QB sneak with 8 seconds left to win the game. The stat is still nothing to write home about. San Jose State is still converting less than half of its red zone visits into TDs, but for one night at least, they were king, and it lifted them past Wyoming. 482 — Total passing yards by David Fales in Saturday’s game, a personal best (he previously best had come in the Minnesota loss.) The Spartans blew away what had been a strong passing defense in this game (top ranked in the Mountain West), but it wouldn’t have been possible without Jarred Lawson and Tim Crawley running the ball effectively. 16 — San Jose State’s first quarter deficit. The Spartans looked to be on the ropes after the Cowboys quick strike spread offense spread came out and hit them hard. Wyoming running back Shaun Wick (17 carries, 234 yards, 1 TD) was punishing the Spartans defense, which looked like it expected the offense that got roasted by Colorado State last week in the Bronze Boot rivalry game rather than the one that challenged Nebraska and roasted Air Force and beat New Mexico. They worked their way back afterward, and erased it late in the third thanks to 22 straight points that quarter. 3 — Three straight three and outs by the San Jose State defense after they struggled mightily early, three TDs by the offense in the third quarter to take the lead against the Cowboys. Of note, but not fitting the theme, two turnovers forced: A fumble and interception The defense has had its share of struggles this season, but with a chance to make adjustments, they can slow down almost anyone in the conference. 5 — Streak of games with 300 or more passing yards for David Fales, who became the first Mountain West quarterback in the conference’s 15-year history with five straight games of 300-yard passing or more. How Fresno State’s Derek Carr wasn’t first to this last year or this year escapes me, but kudos to the senior Spartans QB anyways.